La Camarilla Racquet, Fitness & Swim Club is the oldest continually owned tennis and health club in the Valley. While many health & racquet clubs have opened in the Valley over the past 25 years and many of those changing ownership, La Camarilla Racquet, Fitness & Swim Club have stayed the same and has not only endured many other clubs opening in its area but has prospered. When La Camarilla opened in 1982, it set a standard of excellence by starting with a strong staff of nationally certified professionals and programs for all ages to help get members fit and keep them fit and continues with those same principles today. La Camarilla offers 16 tennis courts and has an exciting blend of lessons, leagues and social events. 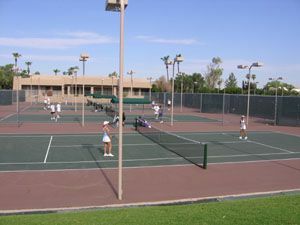 Over 25 teams participate in various Valley league programs and use the La Camarilla courts for their home matches. In addition, 450 kids and adults each week take tennis lessons from a staff of six full time USPTA teaching professionals! Tennis, racquetball, aerobic classes, yoga, Spinning, swim and weight room programs for members of all ages are its main focus. Add to that the Hair & Nail Salon, Massage Therapy, Child care, Weight loss program and Physical therapy and you get a one-stop place for all of your tennis, exercise and wellness needs. La Camarilla takes pride in its place in history in the metropolitan Phoenix area and is hosting an Open House to the public on Saturday, October 6th from 9am-2pm. For more information contact Roger Furman at 480-998-3388, or email roger@lacamarilla.com.